A top location in Florida, Jacksonville offers a unique Florida lifestyle with both sand and palm trees as well as an actual seasonal change. Affordable housing, top medical facilities for both adults and children, as well as a growing and thriving local economy, keep our Jacksonville real estate market in high demand. Communities in Jacksonville range from beach side communities, to in-town walkable communities, country clubs, and every type of home in between. Jacksonville is located in the north east section of Florida and is the largest city in the United States by area. The entire county of Duval is the city limits of Jacksonville, which is about 747 square miles of sunshine and blue skies! Our moderate climate with a slight seasonal change has created quite the hot spot for relocation of both those wanting to enjoy a more year round outdoors climate as well as retirees and corporations looking for the right locations to grow and attract top talent. Residents of Jacksonville have the opportunity to enjoy a countless number of activities that will keep you and your family busy year round! A thriving and growing city, Jacksonville has become nationally recognized as one of the top cities for both Millennials and job growth. Jacksonville has also been noted as one of the Best Places to Live by US News. We have no state income tax and an overall young population which has fueled our cities growth. The entire area of Jacksonville, which would include the adjoining counties, houses about 1 million residents. The Jacksonville real estate market is a hot one! We have seen over 25,000 properties change hands per year in recent years, and that trend doesn't appear to be slowing. Our overall real estate market is strong and affordable. Single family homes are affordable for most working residents, and mortgages are easily available. 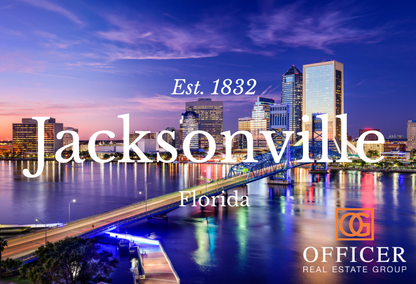 In 2016 Jacksonville posted an average home price of $226,000. This is still a lower average price than some of the largest populated cities in Florida, making Jacksonville a very affordable city. The local Jacksonville market does experience a mild swing of housing sales during the normal winter / holiday months, but not by national standards. Since we have such a mild winter and an enormous amount of sunny days, the housing market stays strong year round. Homes that are marketed correctly with the right staging, photography, and price will always sell very quickly. For those Selling your home in Jacksonville FL, the average days on market has been below 90 days! Put your home for sale on the market, and on average it'll be under contract within 90 days or less. The local Jacksonville real estate market is made up of condos, single family homes, and town homes. Jacksonville has walkable in-town neighborhoods with small bistros, coffee shops, trendy restaurants, and popular watering holes. Golf club communities are super popular with their year round sports programs. Beach and near beach communities continue to be some of the hottest real estate on the planet, with continuous construction of both old homes being renovated and many new homes being "filled in". In the 2000's we've had a huge growth surge in Northern St Johns county which draws many residents to their new construction communities as well as some of the top schools in Florida. Where Is A Good Area To Live In Jacksonville? Budget: Money will dictate location, neighborhood, house, everything... We have to know your top range and we can work backwards from there. Schools: Are schools important? Do you require the absolute top tier public schools, magnet schools, gifted programs, or private schools. Proximity to your employment: Most of our customers want to be within a 30 minute drive to their office. Proximity to airport: Many of our customers commute to other cities or travel weekly, so this can become a factor in location. Proximity to Medical facilities: Do you need to be near a certain doctor or specialist. Lifestyle priorities: Waterfront, oceanfront, pool, golf course. country club, gated community, equestrian, HOA community, lock and leave, walkable in-town, urban, 55+ age restricted, walkable to the beach, etc. Jacksonville has a wide array of neighborhoods available. You can choose from starter home neighborhoods, gated private communities, beachfront estates and just about everything in between. Below are neighborhoods that we've segmented by lifestyle. This is sometimes the easiest way to search homes for sale! A major draw to living in Jacksonville Florida is the fast access to the white sand beaches of our Atlantic coast. Even better, you can live at the beach! The beaches are considered anything East of the Intracoastal. An easy walk to the beach or even better, ride your beach cruiser to the beach. Click on any of the beaches areas below to view properties and homes for sale within the beach communities. If you live in Florida you can golf year round in comfortable temperatures. We are lucky in Jacksonville to have some of the best golf courses and plenty of golf communities to choose from, and some offer homes that are affordable for most working families. If you'd like to live within a golf course community in the Jacksonville area, you can explore these communities below. The urban lifestyle in Jacksonville comprises of both directly in the city living via luxury downtown Jacksonville condos and the surrounding communities of San Marco, Avondale, Riverside, and Springfield. There are many reasons to own a home and live within one of these thriving neighborhoods, but the main reason is proximity to downtown Jacksonville. Sporting events, concerts, plays, some of the best dining establishments, and the growing number of local breweries are just a few more reasons so many choose a home close to downtown Jacksonville. It's rare to find a city that has this many major waterways. Jacksonville has the St Johns River, the Intracoastal, and borders the Atlantic Ocean. You can find waterfront homes on the river in Jacksonville, Intracoastal homes, and beachfront or ocean front homes all up and down the east coast of Jacksonville and Ponte Vedra. Search Waterfront Homes. To see a list of homes that were listed for sale within the last 24 hours, visit Just Listed For Sale in Jacksonville. Staying in tune with the local housing market, keeps our finger on the pulse for any changes leading to a buyer's market or a seller's market. Check our News section on the site for updates to the local house market. We do get questions on specific markets and we'd be glad to run any housing market data that you may deem necessary for your own housing search or your own home's value. "Best" area to live in Jacksonville is a variable for every resident. "Best" may be the closest to your office, to the beach, to school, or to friends and family. When relocating to Jacksonville, please contact us and we'd be more than happy to speak with you about all the different areas that could be the perfect fit for your new Jacksonville Home. One recommendation... shop for a pool home! They are always in demand and always in use in our Florida climate. We are currently seeing many new construction neighborhoods in Jacksonville active again. Most new construction single family homes are priced $200k and up, and town homes are in the mid $100's and up. There are also many custom home builders at every price point from luxury estate home builders to entry level homes. If you'd like any referrals to the best custom builders, please don't hesitate to call or email. Are you moving to Jacksonville? Relocating to Jacksonville for a job or for family? Do you already live in Jacksonville and want to buy your first home or want to trade up? We can certainly help! We are full time, professional REALTORS in Jacksonville, and would be very happy to help you find and buy or sell and buy a home in the Jacksonville area!